WASHINGTON, DC--(Marketwire - Nov 6, 2012) - Generation Opportunity continued its national social media and grassroots Get Out The Vote (GOTV) reminder efforts to its over 4 million young adult followers by encouraging them to GO vote. According to the 2011 Pew Internet and American Life Project, Facebook users are 43% more likely to vote, 2.5 times more likely to attend an event or rally, and 57% more likely to persuade a friend or co-worker to vote. A recent poll of Millennial voters (young adults ages 18-29) found that of the GOTV reminder tools that will have an impact on young voter turnout, Facebook ranked first at 59 percent and text messages ranked second at 50 percent. Only 18 percent of Millennials thought a phone message would be effective. Generation Opportunity is the largest non-profit, non-partisan organization engaging young adults in the United States. The organization utilizes a strategy that integrates sophisticated social media and grassroots tactics to organize and mobilize young voters. Since 2011, Generation Opportunity has provided a forum for young Americans to discuss key concerns, such as high unemployment, the lack of full-time jobs, the lack of economic opportunity, and how these issues are directly related to the decisions and policies of elected leaders in Washington, D.C., and state capitals. The organization's Facebook posts related to these issues, nearly all of which are sourced and linked to news stories and official reports, have been viewed over 1.1 billion times. The content has garnered well over 9 million shares and comments. Generation Opportunity field teams have trained student leaders, established volunteer networks, and conducted hundreds of events in states including Maine, Virginia, Florida, North Carolina, New Jersey, Ohio, New Hampshire, Michigan, Nevada, Colorado, and Texas, among many others. Facebook Vote Reminders - Graphic messages counting down the number of days to the election as well as graphic reminders of what is at stake at a time when young adult unemployment is so high. 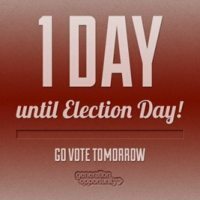 Video Reminders to Vote - Two targeted videos to remind young voters of the importance of voting and the need for real, substantive change -- especially for those whose careers and dreams have been delayed by the poor economy and who have had to move back in with their parents due to high unemployment. Where To Vote - Dedicated tool on the Generation Opportunity website powered by the CAPWHIZ solution produced by Congressional Quarterly that allows young Americans to determine their exact polling location. The site has already been visited by tens of thousands of young voters preparing to cast their ballots in the presidential election. Grassroots Action Center - An online tool for young activists to write letters to their member of Congress, the local media, and even send video messages to President Obama voicing their concerns about the lack of jobs and opportunity. Activists can also remind friends to vote via social media or email, view the candidates on their ballot, and find their polling location. "Young Americans have closely followed the news through social media over the past several years and, through their own life experiences, have become experts on the poor economy. Through no fault of their own, the lack of meaningful, full-time jobs and high unemployment have denied them critical skills, earnings, and experience. It should come as no surprise that they are highly engaged in the 2012 presidential election -- their futures are literally at risk," said Paul T. Conway, President of Generation Opportunity and former Chief of Staff of the United States Department of Labor under Secretary Elaine L. Chao. 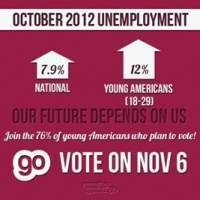 "On Election Day, millions of young Americans will reject the status quo and those who defend failed economic policies. This will not be done out of any desire to get even, but rather out of sheer disappointment that they have already paid a high price for the change they voted for in 2008 through their stalled careers and delayed dreams. Their decision this year will reflect a genuine desire to get the country and their own lives back on track." Only 36% of Millennials agree with the statement "generally speaking, things in the United States are heading in the right direction." 55% are not confident that America will still be a global leader in five years if the USA continues along the same path as the last few years. 59% agreed they will learn more about the policy positions of the presidential candidates in 2012 than they did in 2008. 6% - Do not know/cannot judge (accepted only this response). Which will be the more important to you in casting your vote for President in 2012? 5% - Do not know/cannot judge (accepted only this response). For Generation Opportunity, the polling company, inc./WomanTrend conducted a nationwide online survey of 1,003 American adults ages 18-29 between July 27 and July 31, 2012. Randomly selected online opt-in panel participants were sent an invitation to the survey via email which included a secure link to the online questionnaire. Quotas were used to ensure the survey was representative of the larger 18-29 year old nationwide population with regard to race, region, and gender. The data were NOT weighted. The overall sampling margin of error for the survey is ±3.1% at a 95% confidence interval, meaning that the data obtained would not differ more than 3.1 percentage points in 95 out of 100 similar samples obtained. Generation Opportunity is actively organizing young adults across America through grassroots tactics, voter registration, and voter turnout efforts, engaging over a quarter million young adults. The organization's social media platforms have amassed a total fan base of more than 4 million. Facebook pages post links to relevant articles and reports from sources ranging from the federal Government Accountability Office (GAO), to The New York Times, The Washington Post, The Brookings Institution, The Wall Street Journal, The Huffington Post, and The Heritage Foundation. For our Spanish-language page - Generación Oportunidad - click here.